2. Type "BEDIT" on the command line and press "Enter". 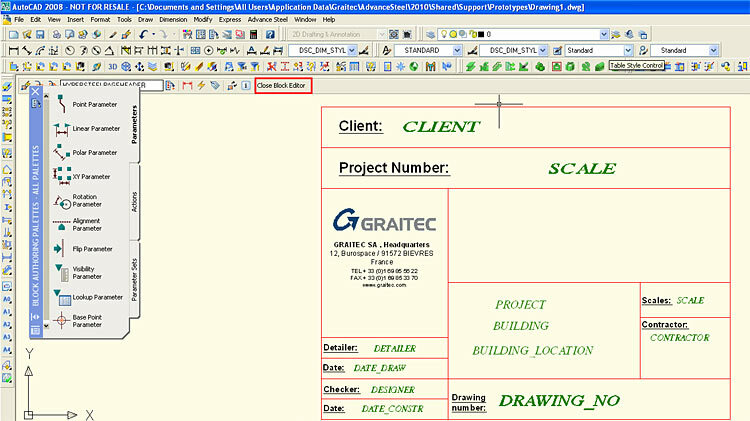 A dialog box, as shown in the following figure, will appear where you should select "HYPERSTEELPAGEHEADER" and click "OK". 3. Make the desired modifications. 4. "Save and exit" the editing. 5. Type "ATTSYNC" on the command line and press "Enter". 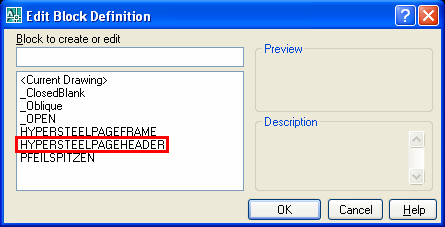 Choose "select" and pick the block that you modified, and then press "enter" when asked for "HYPERSTEELPAGEHEADER". The header is updated with the modifications. These modifications do not apply to the existing drawings; the existing drawings must be recreated with the edited prototype.